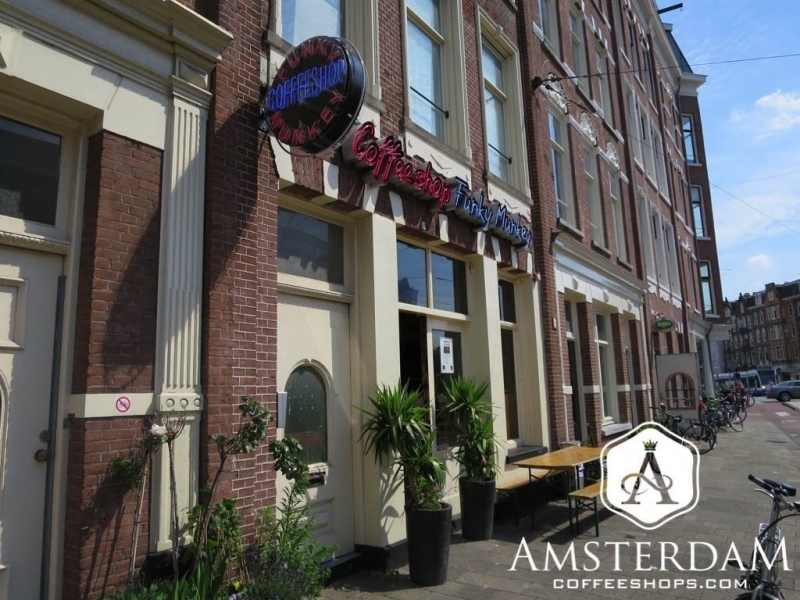 Funky Munkey Coffeeshop is located on Marnixstraat, at the very western edge of Amsterdam Centrum. 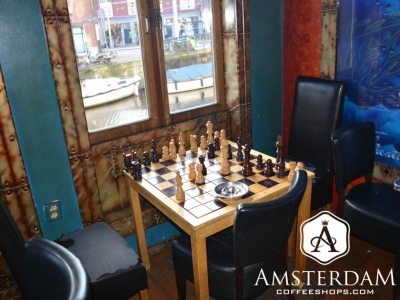 It is within the Jordaan neighborhood, which is one of the more picturesque parts of the city center. 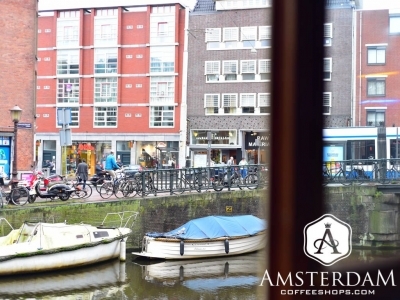 This area is home to many small trendy shops, cafes, and restaurants, as well as beautiful historic apartment buildings and canal homes. You may have to head east a couple of blocks to see the best of it, though. The décor inside this shop is well maintained, and arguably very comfortable. Leather couches and chairs line the walls, next to polished wooden tables. The floor is some type of hardwood, smooth and shiny. 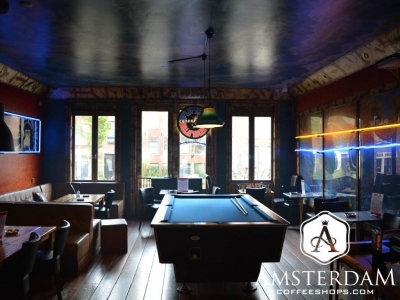 The walls and ceiling are all painted in a complex interconnected design as well, making this seem somewhat of a “theme” coffeeshop, if the theme were simply “cool”. The best way to describe Funky Munkey would be to say it is a cross between a city coffee house and “man cave”. There is a pool table in the center of the room. A chess table rests in here as well. 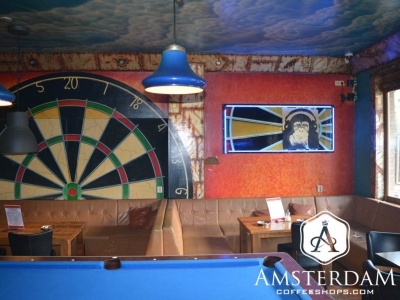 A giant representation of a dartboard is hung on one wall. There is a flatscreen TV, some neon, a vending machine when you need a quick fix... it is a really comfortable place to chill. On the same note, the management here is big into music. 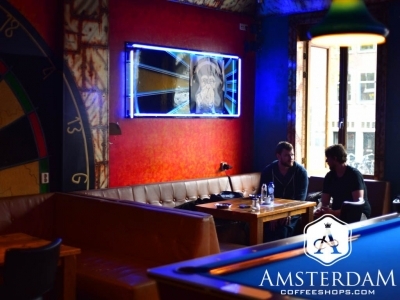 You will find live concerts here often, and some really funky beats on the speakers otherwise. There are a lot of windows in here too, and bench seating out front if you prefer some fresh air. 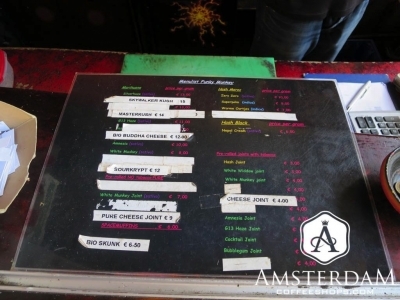 The cannabis menu here is moderate in size. Further, it is simply a mess of taped on amendments. It is impossible to see what the original menu looked like, as it has been updated so many times. This establishment tends to rotate its stock quite a bit, and seems little concerned about the look of the menu in the process. As for the stock, on the weed side we tend to find a bit under a dozen items, mostly old-school strains. 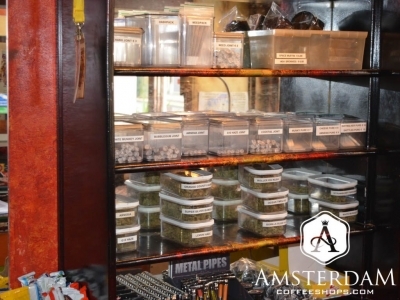 The hashish selection is smaller, consisting mainly of Moroccan imports. Do not skip over it. The owner here is a hash smoker. He smokes what he sells, so there is usually some high quality product on hand. Funky Munkey is an upscale “man-cave-ish” coffeeshop. 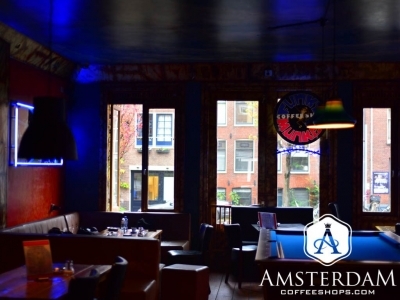 They offer a compellingly chill and comfortable atmosphere, along with a quality cannabis menu. This is an excellent establishment, worth special trip, especially if this kind of “funky” environment sounds good to you.